Home / CRUISING THE PAST / Micky Arison’s Carnival Corp and Italian Govt. call off search for missing American victims of Costa Concordia disaster. 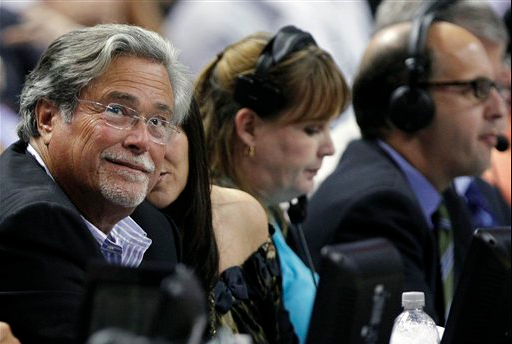 Micky Arison (CEO of Carnival Corp and owners of the sinking Costa Concordia) watched basketball game in Miami, while an American couple are presumed missing and lost at sea. Arison, an Israeli-American citizen, refused to head to Italy in support of cruise victims. Instead Arison’s Carnival Corp offered victims of cruise ship disaster $14,000 plus change for their horrifying experience. Panic inside the Costa Concordia. Costa Cruise Lines (Carnival Corp) and the Italian Govt. are ending the search for missing people in the submerged part of the Costa Concordia cruise ship due to the danger to rescue workers. Cruise line officials said Tuesday that technical studies indicated the deformed hull of the ship created too many safety concerns to continue the search within it. Relatives of the missing and diplomatic officials representing their countries have been informed of the decision, it said in a statement. Search for Americans abandoned. Costa Concordia proves a deathtrap for elderly couple. Is the evacuation of the ship a total chaotic nightmare and cover-up? A spokeswoman for Carnival Corp. stressed that the search for the missing would continue wherever possible, including on the part of the ship above the water, in the waters surrounding the ship and along the nearby coastline. 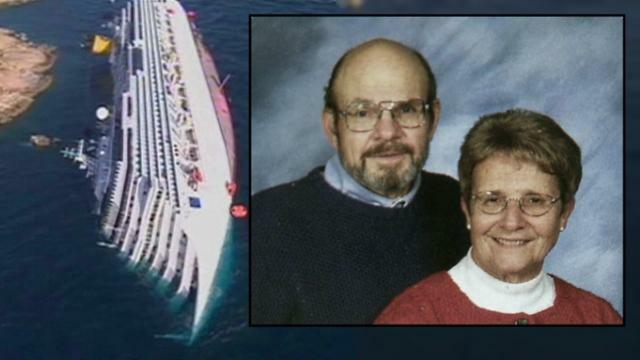 Jerry and Barbara Heil of White Bear Lake, Minn – were lost at sea in Carnival Corp’s Costa Concordia disaster. From all the videos online this could criminal tragedy could have been prevented if Carnival Corp (Costa, Carnival, Cunard, Holland America, Princess and Seabourn) had proper safety procedures on their ships. But Micky Arison and Carnival Corp are notoriously anti-union, offer substandard wages, work crews overtime, hiring inexperienced and what seems to be ill-trained crews according to many websites. Is this true? The Concordia ran aground off the Tuscan island of Giglio on Jan. 13 when the captain deviated from his planned route and struck a reef, creating a huge gash that capsized the ship. The captain then fled the ship. Russian cruise passengers paid of crew members to let them off cruise ship first. Reports of total chaos aboard the large tourist ship made the liner a floating nightmare. Are ships such as Royal Caribbean International’s cruise ship Royal Caribbean International’s deathtraps? Imagine 8,000 passengers trying to get off this floating condo in a fire or hurricane. Some 4,200 passengers and crew were on board when it capsized. Seventeen bodies have been recovered, of which one has not yet been identified. Sixteen people are listed as missing but are presumed dead. The last time anyone was found alive was Jan. 15. Two American passengers still remain missing. Jerry and Barb Heil of White Bear Lake Minn. are victims of the Carnival Corp’s Costa Concordia disaster. 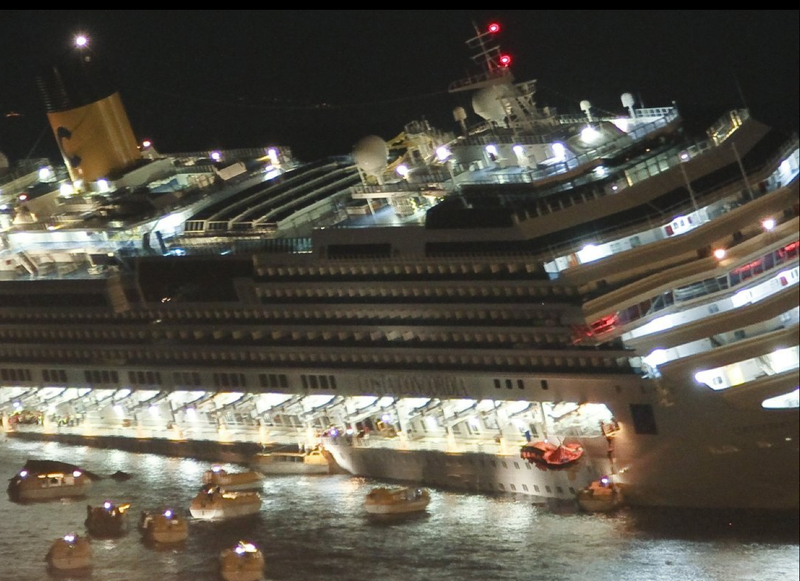 Photo and content for this entry are from Italian and British media companies covering the Costa Concordia disaster. Many thanks to these excellent journalists. American media has done very little regarding the coverage or concern regarding the American passengers presumed dead. As for the US Congress – many online sources say the government has been totally bought off by Micky Arison and Carnival Corp. This can’t be true? Previous: History of Carnival Corp’s CUNARD LINE… when “Getting There WAS Half The Fun”!